L.L. Bean heiress reinvents herself and reshapes a sustainable industry. Granddaughter of sporting goods icon Leon Leonwood Bean, Linda L. Bean is branching off from the well-known family business into a new direction for herself--building a crustacean empire that will preserve lobster fishing in Maine and reinvent the way Maine lobsters are handled, marketed and promoted. Lobster was never part of Linda Bean's life plan. She served on the board of Freeport, Maine-based L.L. Bean, raised a family and ran for Congress twice. Her well-known conservative views didn't get her elected either time. A difficult divorce in 2006, when she was 61, woke her to the fact that she needed a new plan for her life. She found a desirable house in the Port Clyde area, with picture-perfect views of fishing boats, the ferry to Monhegan Island, a modest lobster wharf and brilliant sunsets. What she didn't learn until after she purchased the house was that it came with the lobster wharf and a 2-acre saltwater pond where the lobsters are stored until they're ready to be processed or shipped to market. Suddenly, knowing nothing but how to cook, shuck and eat lobsters, she was in the lobster business. Smart businesswoman that she is, she hired wharf owner David Albino to spend the next six months introducing her to Maine lobstermen and training her in the business. "It was a new lease on life," Bean says. "My three boys were grown; I needed a big challenge to take my mind off the personal problems I'd dealt with during the divorce proceedings. And boy, did I find one!" Calling her new company Linda Bean's Perfect Maine, she has developed a vertical integration of businesses that start at the sea floor and end with restaurants and franchises that bring lobsters to practically anyone's dinner table. It also includes a number of other businesses, such as a sporting camp near Mount Katahdin and a general store in Port Clyde where locals and visitors alike can rent kayaks or sit outside on the deck of her restaurant, the Dip Net, imbibing a favorite drink and enjoying one of Linda Bean's Perfect Maine lobster rolls. That first year was a challenge. Bean discovered that most Maine lobsters were being processed in Canada, which meant that Maine fishermen lost out on a share of the profit. "The average lobster goes through several hands--the catching, staffing the wharves and pounds, processing and preparation--and each one added cost to the sale price. I was determined to return as much of that money to the fishermen as I could. Maine fishermen are an endangered species," she says, "and I'm passionate about preserving the industry. In order to do this, I pay more for the catch than others do, and I don't charge fishermen a profit on bait or fuel; I just charge them what I pay." Since starting the business in 2006, Linda now owns three wharves and a processing plant where the lobsters are shucked and cut for stews, salads and other dishes. She also owns or franchises seven new restaurants/lobster kiosks from Maine to Florida. Her specialties include Linda Bean's Perfect Maine lobster roll and Linda Bean's Perfect Maine lobster stew. She's still perfecting the franchise document and says she wants her business to reflect the same high quality and guarantee as her grandfather's business in Freeport. She also wants people to know that her company is committed to sustainable fishing. The company only purchases lobsters of an approved size. If it's too small or too large, it's thrown back. "The lobstermen throw back a good percentage of the egg-bearing female lobsters to preserve the species," she says, "and each lobster we sell is branded, tagged with the Linda Bean's Perfect Maine logo, and the date and location where the lobster was caught." She anticipates certification soon by the Marine Stewardship Council, which will protect and enhance the brand as sustainable and of high quality. Linda Bean is not just selling lobsters; her vision includes opening new markets and selling wholesale across the nation to groceries and big-box stores. "In simple terms, I'm trying to promote Maine and preserve its lobster-fishing industry." 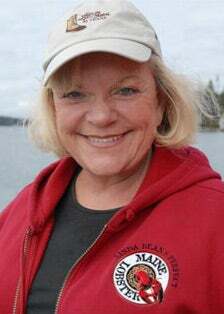 Linda Bean's Perfect Maine anticipated purchasing 3 million pounds of lobster from fishermen in 2009, but the recession lowered that expectation to 2.5 million. She anticipates a larger purchase in 2010 and hopes to sell up to 4 million pounds. Bean employs nearly 150 people, including about 100 fishermen. Asked about her advice for other women considering entrepreneurship, Bean says women must maintain their own vision and their confidence, no matter what others say. "This is not a typical business for women, but I've shown it can be done. You have to keep your eye on the ball at all times and learn everything you can about your industry." While she anticipated some resistance from the fishing community, given that very few women are in the industry, she says she was treated fairly. "I think people saw that I was serious and in it for the long haul, and they treated me respectfully."